Egg hunting has gone to the dogs! 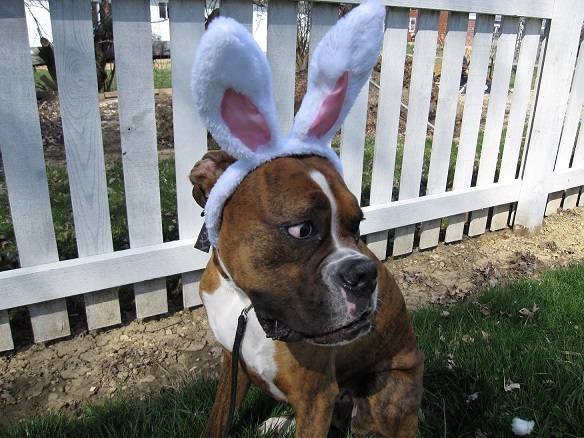 Easter is a time for candy, chocolate, and bunny rabbits…none of which a dog should be allowed to eat. Instead, Acme Canine will host a doggie Easter egg hunt, where your dog can come enjoy the holiday traditions with some canine-friendly treats. The whole family is invited, but the hunting is up to the hounds. If your dog is the first to find the Golden Egg, you will win an Easter basket valued at over $50 in prizes! We’ll also be taking photos of your dog with Easter Bunny ears to document this fun event. This entry was posted in The History of Acme Canine and tagged Columbus Dog Event, Doggie Egg Hunt, Easter Egg hunt for Dogs, games for dogs, helping shelter dogs, March dog event, Morrow County Shelter. Bookmark the permalink.